Missoula With the truck brought to the curb with transmission problems, I found myself in this small, university-based town for the weekend. Looking for a guy who knew mechanics, I walked through a Saturday farmers’ market near the river that was jumping with young families and children with strollers abounding and smartphones crushed to their ears. 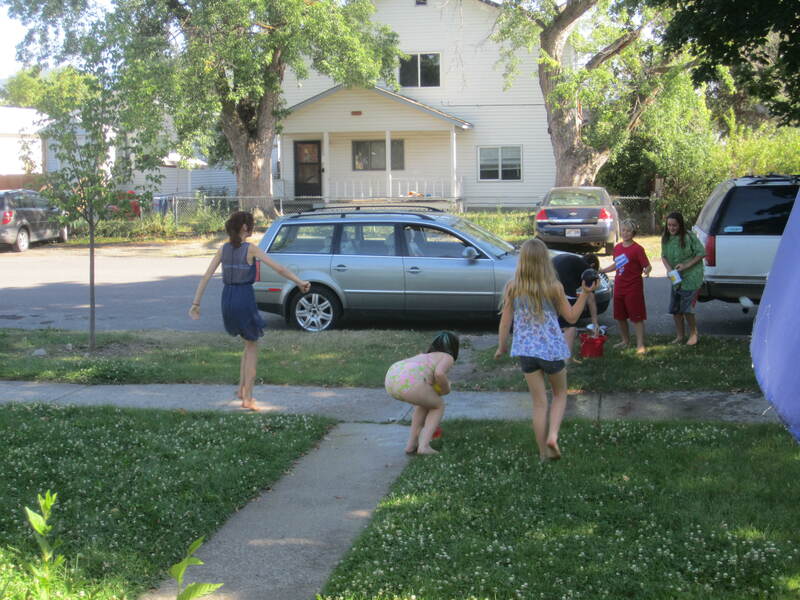 Later in the evening, kids on the block engaged in a water balloon and flaying hose “fight” for hours as an excuse to keep cooler on a hot day, laughter peeling to the streets. I felt like I was being transported back to a Norman Rockwell painting of the 1950’s. Sitting with friends who were longtime residents or natives of Montana in the yard of the house where we were squatting, as sausage cooked on the grill and the sun finally began to set, the subject that quickly jumped to the surface was, “who are these people and what are they doing here?” The term “new economy” was bandied about. People tethered to a high speed internet connection who could work anywhere on web startups, bio-mimicry, research, e-commerce, and the like, who wanted a laid back, small town lifestyle and had the money to make it happen. The days when they remembered sagebrush where the malls are now, and cowboys tipping their hats on wobbly legs at dawn on Sunday mornings, was long gone now and somewhere – or nowhere — else. They wondered whether folks in their fifties and sixties were too old to press the “reset” button on new careers, and theoretically agreed it was possible, and practically had no interest in doing so. Earlier in the week, walking through Walmart, the number of older workers seemed legion. My friends were clear: law, slaw. There was discrimination against older workers, particularly when ripping off younger workers seemed such easy pickings. In the wake of the Great Recession, these conversations are in earshot everywhere around the country, not just small, lively Western towns, like Missoula. There are now 2.7 million workers classified as temporaries. The exploitation of young workers as unpaid interns slaving for contacts and network connections in the “new economy” has led to fifteen different legal actions according to ProPublica. Employers are having a field day and dealing with workers desperate for some income with a wink and a nod. $1.2 trillion is estimated by economists in unreported income, which means no taxes paid perhaps, but also means more than that since this figure does not report the level of cash, under-the-table payments by cheap, often immigrant labor that is also providing the infrastructure under the “new” economy. Where were the values though? My friends bemoaned the fact that younger, newer folks in Missoula seemed to just be scuffling with no interest in the environment or conservation. I asked if there was recycling in Missoula because I didn’t see any cans or receptacles. Oh, yes, we have recycling they all said, but it turned out that meant you could contract with a private company or take your stuff to Target who claimed they loaded it on their empty trucks and took it somewhere. So, you really don’t have recycling as a public service then, I said. Well, no, not like that. What new economy? Neoliberalism in city politics with some visual amenities. Worker exploitation, wage theft, and immigrant labor. Great older workers turned out to pasture. Sure sounds like the new boss is just like the old boss, and the new economy has a heavy foot on the everyone’s neck here just like the old one, even if the boots where bought at Patagonia. This entry was posted in Citizen Wealth, Financial Justice and tagged environmental issues, immigrant labor, neoliberalism, new economy, older workers, recession, wage theft, worker exploitation, workers by Wade. Bookmark the permalink.